At the heart of Washington D.C. lies Rock Creek Park, America’s oldest and largest urban national park. Spanning 2,000 acres and encompassing the Georgetown Waterfront, Meridian Hill Park, and Thompson Boathouse, Rock Creek has been attracting visitors for decades. But with over 32 miles of paved and unpaved trails, historic sites, and much more, it can be difficult to figure out how to get the most out of your park visit. To help with this challenge, NatureServe developed the Rock Creek Park Map Viewer. Built by Blue Raster, the interactive map acts as a field guide focused on highlighting the natural communities of Rock Creek. The Map Viewer arms park visitors with the knowledge and skills to “read” the natural landscape and hit the trails with a personalized hike route. Using the application’s “Build-a-hike” tool, users can create custom hikes and print reports on what they will see on the trail. Resource management specialists, park rangers, and interpretive staff also use the site to better manage natural areas and generate reports on areas of study. The Map Viewer is funded and supported by a partnership with the National Park Service. Currently released to highlight Rock Creek Park, the viewer is designed to easily expand to other locations across the country. Blue Raster built the Map Viewer using ArcGIS for Server and ArcGIS Desktop. 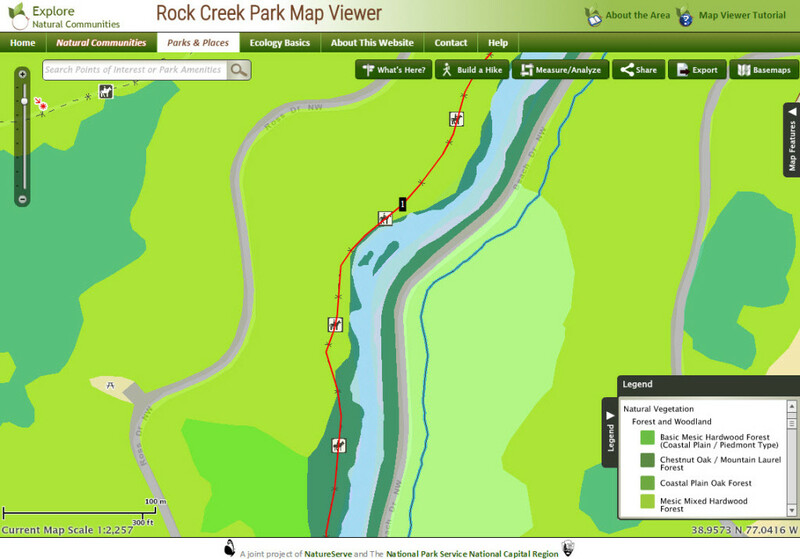 Visit the Rock Creek Park Map Viewer today.